Research and publications on promoting women in business. 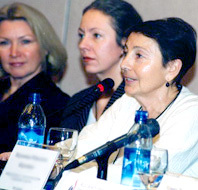 Educational programs for young people; participation in prominent international events, lectures and presentations on women’s role in development of the Russian economy. Became one of the founders and General Partner of Leadership Without Borders community. All projects were extremely successful and brought The Committee 20 well-deserved recognition in Russian and internationally. Membership is by invitation only and includes owners and senior executives of major companies and corporations — industry leaders. The candidate should be recommended by at least two active members of the C20.